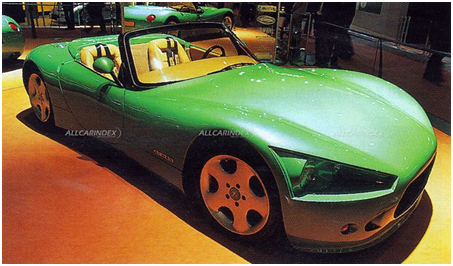 Audax is probably one of the more controversial low volume French sports cars, and for more than one reason… Firstly its design was claimed to be the result of a 1997 Franco Sbarro styling exercise, secondly some promo material claimed it to be more BMW than a BMW! …it powered by an X5 BMW V8 engine, and thirdly it is a car that is claimed to have reached limited production and yet few if any people have seen one on the road. Its styling alone could be viewed as a little controversial too, but there is definitely a relationship to the Z3 Roadster, in general shape if not in detail. The car itself has a comprehensive large diameter spaceframe style chassis and a unique no-roll suspension. It is also claimed to weight only 950kg, and have a 285kph top speed. The Audax is an interesting and quite technical car that despite its different looks deserved to have done better. 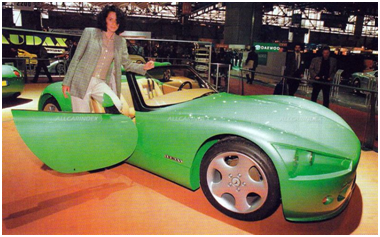 In fact, PGO, a successful small French manufacturer re-launched the car with different power units in 2000 and continued production, successfully it is said, for another three years …and yet where have they all gone? January 22, 2016 January 22, 2016 rarefrenchUncategorized1996 Geneva, Audax, Audax Engineering, Audax Roadster, BILSTEIN dampers EIBACH, Gérard Hély, Mono Interactive, Olivier Moret-Bailly, PGO, Sbarro Alcador, X5 BMW.